80064 is rated 4.8 out of 5 by 197. Rated 5 out of 5 by BOB502 from Great Qaulity for a Great Price!!!! Better than what I did have which had to modify to except a oil pan with a kick out but it still didn't fit like I would liked. My motor being a BBC I wasn't comfortable transporting it to the machine shop. So I ordered this one from Jegs and it was shipped to me fast and my BBC motor fit on it perfect just in time to transport it to my machinist. Thanks for a great product and fast delivery. Rated 5 out of 5 by Mundelein Automotive from Great tool! We bought this to store a small block Chevy under our workbench. It is easy to assemble and rolls nicely when loaded. Rated 5 out of 5 by Shmorg from Simple and Reasonably Priced This stand is clearly an offshore manufactured product and this is reflected in the price. Looks good and can’t wait to get an engine dropped into it. Rated 5 out of 5 by Ricjon from Moves easily I can wheel my 454 around the garage floor with ease using this cradle. Rated 5 out of 5 by Todd Hoof from Worked Perfect! 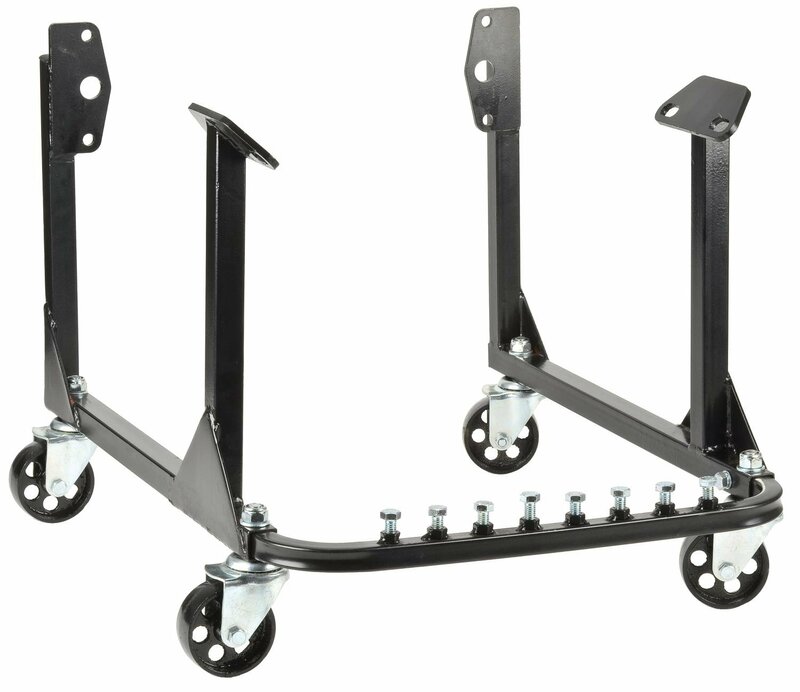 needed 2 of these stands for my 502 engines going in my boat. The stands were well built with great wheels and bolted up with no issues. Rated 5 out of 5 by dc8flygy from Great Cradle Needed one quick. Shipping and delivery was super fast. Simple assembly. Motor mounted up with very little hassle. Rated 5 out of 5 by Cootkiller from Sturdy cradle at a great price. The cradle went together easily and does what’s it’s made for. It has really made moving the engine and getting it on the lift so much easier. Rated 5 out of 5 by Comp788 from Nice part I bought this to ship an engine on. I did not use the wheel and bolted it down to a pallet. It worked perfectly for my application. Can I test run a engine on the cradle. Will this fit a 3.1L MPFI 60 degree engine? No, this is not designed for the 3.1L engine. We do not currently have an engine cradle for the 6 cylinder Cummins application. Will this work for the 4.3 v6? Yes, this should fit your 4.3 V6 engine. Can I keep the transmission mounted on the engine with this stand? The back bolts need to go into the engine to hold it, you may be able to modify it to work. Will this fit a 302 v8? JEGS 80065-1 - Replacement Swivel Caster 3"